WASHINGTON, May 2, 2011 – Agriculture Secretary Tom Vilsack today introduced an Internet-based mapping tool that pinpoints the location of “food deserts” around the country and provides data on population characteristics of census tracts where residents have limited access to affordable and nutritious foods. The online Food Desert Locator, developed by the U.S. Department of Agriculture’s (USDA) Economic Research Service (ERS), is a tool that can be used to assist efforts to expand the availability of nutritious food in food deserts, or low-income communities that lack ready access to healthy food. Expanding the availability of nutritious food is part of First Lady Michele Obama’s Let’s Move! initiative to address the epidemic of childhood obesity. A food desert is a low-income census tract where either a substantial number or share of residents has low access to a supermarket or large grocery store. “Low income” tracts are defined as those where at least 20 percent of the people have income at or below the federal poverty levels for family size, or where median family income for the tract is at or below 80 percent of the surrounding area’s median family income. Tracts qualify as “low access” tracts if at least 500 persons or 33 percent of their population live more than a mile from a supermarket or large grocery store (for rural census tracts, the distance is more than 10 miles). This definition was developed by a working group comprised of members from the departments of Treasury, Health and Human Services, and USDA, which is partnering to expand the availability of nutritious food. Under these income and food access criteria, about 10 percent of the 65,000 census tracts in the United States meet the definition of a food desert. These food desert tracts contain 13.5 million people with low access to sources of healthful food. The majority of this population—82 percent—live in urban areas. Users of the Web-based product can view a map of the United States that highlights and identifies census tracts that qualify as food deserts. Users can scan the map and zoom into an area or use the search feature to find a specific location. Users can create maps showing food desert census tracts. They can also view and download statistics on population characteristics of a selected tract—e.g., the percentage and number of people that are low income and have low access to large grocery outlets, or the number of “low-access” households without a car. In Cook County, Ill., for example, which includes Chicago, 39 census tracts are food desert tracts. These tracts contain over 81,000 people with low access to a supermarket, including over 26,000 children under the age of 18. With the Locator, users can zoom in and view street names and other features of these and other food desert census tracts. The Food Desert Locator comes on the heels of an earlier Web mapping tool documenting indicators of food access, which was also developed by ERS: the recently updated Food Environment Atlas. That product, unveiled by the First Lady at the launch of her Let’s Move! initiative last year, presents a broad set of statistics on food choices, health and well-being, and community characteristics. It includes indicators of food access, but does not define or identify food deserts. The Atlas presents data at the county level, while the new Food Desert Locator data are at the census tract level, covering smaller subdivisions whose general population characteristics are often relatively homogeneous. 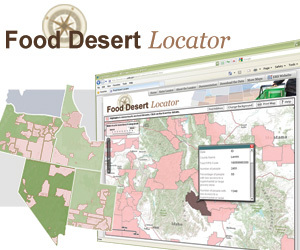 The Food Desert Locator is on the Web at www.ers.usda.gov/data/fooddesert. The site contains an online media kit that provides downloadable images and logos. USDA’s Economic Research Service is the department’s primary source of economic information and research. ERS conducts research programs that inform public and private decision-making on economic and policy issues involving food, farming, natural resources, and rural development.